In many states, wills are automatically considered valid if they are self-proving. To create a self-proving will, the witnesses and the testator sign twice. First, the testator signs the will in front of two witnesses and the witnesses then sign the document, too. Next, the testator and the witnesses swear, before a notary, that the will was signed in each other’s presence. The notary then affixes her notary seal to the document. When a will is not self-proving, most states require that the witnesses affirm to the court that the testator actually signed the will. Usually the witnesses affirm that they saw the testator sign the document. In some instances, the witnesses affirm that the testator confirmed that his or her signature appeared on the will. Generally, the witnesses provide this information to the court through sworn oral testimony. However, some states allow the witnesses to provide the information through sworn written testimony called an "affidavit." State law may only require the testimony of one witness. Problems arise when one or both witnesses cannot be located, cannot be identified or have died. State laws dictate how the executor should address this situation. In most states, the executor will have to perform a diligent search for the witnesses. 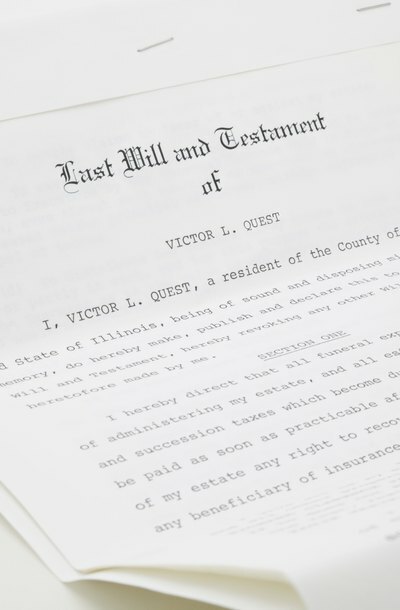 If the witnesses still cannot be located, some states allow the executor to validate the will by providing sworn testimony that he or she believes the will is valid and authentic. State laws on holographic wills vary dramatically. Generally, a holographic will is one written by the testator and not witnessed. Some states require that the entire holographic will be written in the testator’s handwriting. Proving a holographic will is much more difficult for the executor because evidence must be provided to the court proving that the will was actually executed by the testator. Commonly, known handwriting samples from the testator are submitted to the court for comparison with the will.